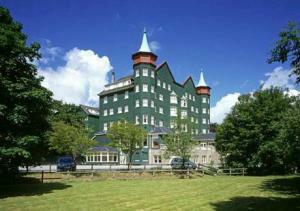 Choose from 12 hotels and guest houses in Powys. Shown below a just a selection of the hotels available. To search within an area please use the menu on the right. Get away from it all at this hotel high on the side of the Black Mountains, overlooking the Usk Valley and the surrounding hills. Good food, warm hospitality and excellent facilities await those looking for a welcoming place to escape to. Relax and unwind in a fully equipped gym and indoor pool, or dine in the restaurant which uses fresh ingredients from their own farm. Out of doors, make the most of this hotel's location in the Brecon Beacons National Park, and go walking on one of the many public pathways. Visit the market towns of Crickhowell and Abergavenny or hike, climb or ride amidst the beautiful countryside. Take in the spectacular views both on your outings and from the hotel. Originally built in 1870 as a Victorian workhouse, this beautiful mid-Wales hotel is rich in original character and traditional charm, with free Wi-Fi and spacious and elegant en suite rooms. Set against the dramatic backdrop of Gwastedyn Hill and the Druid's Circle, the Brynafon Country House Hotel is close to the beautiful Elan Valley and within easy reach of the River Wye. 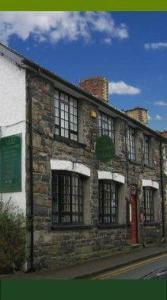 The very heart of the busy and historic market town of Rhayader is less than 0.5 miles (0.8 km) away. Gigrin Farm Red Kite Feeding and Rehabilitation Centre is next door. Family-friendly and pet-friendly, Brynafon has been graded as a 2-star country hotel by Visit Wales, the Welsh tourist board. 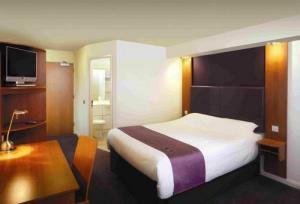 There are 19 en suite rooms, including four-poster rooms and large, comfortable family rooms. The hotel has a bar and a charming restaurant, offering superb regional produce, including a local draught beer and whiskey, gin and vodka brewed at the nearby Pendyrn Brewery at Brecon. In the heart of the South Wales Valleys, just a few hundred metres from Ebbw Vale Parkway Railway Station, the hotel offers comfortable, great-value rooms and free parking. The Premier Inn Ebbw Vale has a convenient location, less than 2 miles (3.2 km) from the very heart of Ebbw Vale's town centre. The nearby train station offers regular services to Cardiff. The hotel has a 24-hour reception desk and some rooms can take 2 adults and up to 2 children (under 16 years). The 2 children also get a free full breakfast when accompanied by an adult eating a full breakfast. An all-you-can-eat buffet breakfast is available each morning and includes the expected cooked items such as scrambled, fried, poached or boiled eggs, and pork or vegetarian sausages. There is also a wide continental selection. The on-site Brewers Fayre restaurant offers traditional, great-value pub favourites in a family-friendly environment. Situated in the heart of the Brecon Beacons National Park, Peterstone Court is loyal to its Georgian heritage but has a contemporary twist. The approach to food is simple and honest: 90% of the meat and poultry served at the restaurant comes from Peterstone Court's nearby family farm. Food is always seasonal and sustainable and features fresh, organic and home-reared ingredients wherever possible. All rooms are large, light and spacious. The spa uses only natural, organic products - a philosophy that has come from the main house. On offer is Ytsara from Thailand and Circaroma, an award-winning contemporary range certified by the Soil Association. Set within a modernised coaching inn, this charming residence is situated on the Offa's Dyke footpath in the small market town of Kington, which lies on the Welsh border. During your stay at the Burton Hotel you can enjoy the range of activities that the surroundings have to offer, including rambling, fishing, golf, pony trekking, motor-rally school, bird spotting and rare plant safari. For moments of relaxation, the Burton provides the Cloud Nine swimming pool and fitness club. With complimentary access for all residents, the club features a gym, jacuzzi, steam room and sauna.